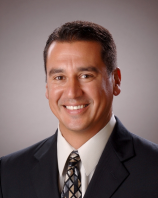 A Santa Maria native, Dr. Joseph Nunez M.D., graduated from St. Joseph High School in 1989. After high school, he attended the University of Notre Dame where he met his wife, Dottie. Dr. Nunez continued his education at UC San Diego School of Medicine in 1998 and graduated from the UCSD Pediatric Residency program in 2001. He joined PMG in 2002, and over the last thirteen years he has played a vital role in the success and growth of the practice. Dr. Nunez is board certified in pediatrics by the American Board of Pediatrics and is fluent in Spanish. Dr. Nunez serves as a mentor for the Marian Hospital high school and college mentoring program. His other volunteer activities include instructing medical students, taking part in the family practice residency program and teaching anatomy classes at St. Joseph High School. He is the loving father to four children, one girl and three boys. During his free time he enjoys coaching club basketball, training his kids in weight training and speed training. He also enjoys running 10k's and 1/2 marathons.